Each year, medical treatments leave millions of patients with chewing and swallowing difficulties. Most hospitals deal with this simply by puréeing their food. The unfortunate result is that food becomes unappetizing, and patients fail to obtain the nutrition they need. 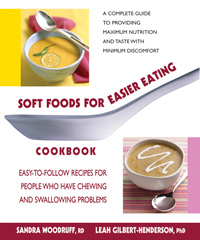 Now, nutritionists Sandra Woodruff and Leah Gilbert-Henderson have written the Soft Foods for Easier Eating Cookbook, an easy-to-follow guide that offers maximum nutrition and taste with minimum discomfort. 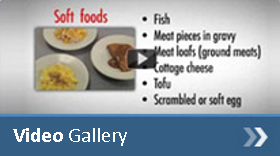 Part One highlights simple strategies for living with chewing and swallowing difficulties, and offers guidelines for modifying recipes for soft and smooth texture, and to increase or decrease calories, fat, and carbohydrates. Part Two presents over 150 recipes for smashing smoothies, sumptuous soups, hearty entrées, and more. Information on nutrition and texture accompany each recipe, making it easy to find dishes that satisfy your dietary needs and your love of good food. Sandra Woodruff, MS, RD, LD/N, holds a master's degree in nutrition and food science from Florida State University. She has worked as a dietitian for a hospital-based wellness center, and is now a consultant, specializing in diet-related health problems. Leah Gilbert-Henderson, PhD, received her doctorate in nutrition science from the University of Tennessee. After moving to Tallahassee, Florida, Leah became a full-time clinical dietitian at a sub acute hospital and long-term care facility.